World Trade Center. 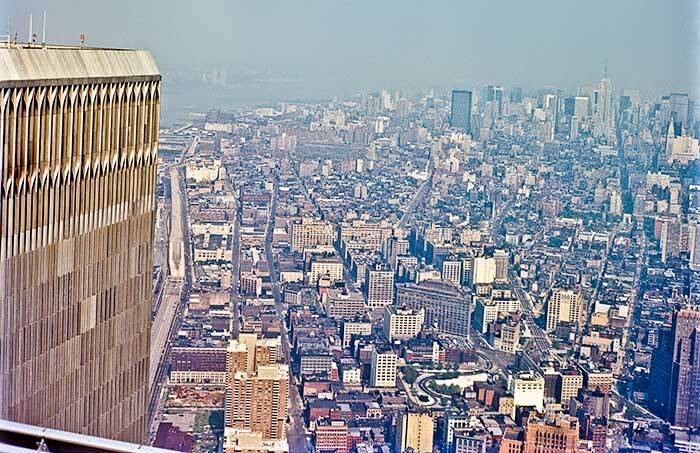 I was on the rooftop in 1977 of one of the Twin Towers. In the lower left-hand corner you can see a bit of the railing. In the distance on the right side, is the Empire State Building. I remember but don’t have any shots of some clouds around the building and a small plane flying below us. Entrance to the roof was possible for many years though I don’t know when it stopped. My last visit was in the year 2000 when my 10 year old son wanted to visit, and the rooftop was closed at the time. On September 11th, 2001 I was on the rooftop of a hospital and watched from New Jersey the smoke rising from the Twin Towers. This entry was posted in NJ Corporate Photographer, NJ Headshot Photographer, NJ Lifestyle Photographer, NJ Portrait Photographer, Photoblogging, Photography and tagged 9/11, Landscape, Life, Manhattan, New York City, Photography, Photos, Pictures, Twin Towers, World Trade Center.